It’s a tale as old as time. Boy falls in love with car. Boy buys car in high school. Boy sells car for some reason he can no longer remember decades later and regrets ever letting it out of his sight. 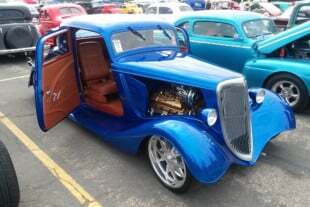 So the story goes for Mike Rosa and his beloved ’33 Ford that was motivated by a big-block Chrysler powerplant. But as we all know, you never can quite let go of your first love. From that point on Mike always had it in the back of his mind that he would one day build another. 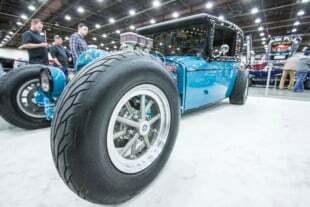 Little did he know that building another one would entail building the car from the ground up, starting with one of Factory Five’s incredibly popular ’33 Hot Rod kits. It all started when his son came across the kit one day. From that point the project took on a life of its own. Mike tells us that the entire project took about three years to complete. He says it would have been completed sooner, but he mostly worked on the car in his spare time and on weekends, drawing out the completion date nearly indefinitely. “The car took three years and I would guess about $150,000 dollars to get it to this point,” Mike said. To some, that might seem a lot like an amount you’d pay to have a professional shop complete the project for you, but Mike completed everything besides the paint himself out of his home garage. However, that doesn’t mean hundreds and possibly thousands of man hours didn’t go into getting the car just right. Mike took the car to MW Restorations where the body had 325 man hours invested in getting the black paint as smooth as glass. We all know how hard that can be, and most would agree that once you invest that much in a car’s veneer, risking it out in the wild would just be irresponsible. And that’s where Mike would disagree with you. Motivating this beautiful ride is a supercharged small-block Chevy making 700 horsepower. A 6-71 huffer provides the mill with pressurized atmosphere while, surprisingly, a built TH350 transmission translates all that power into tire smoke. A Gear Vendors overdrive box ensures that the old (new?) Ford is capable of cruising around at modern day velocity. 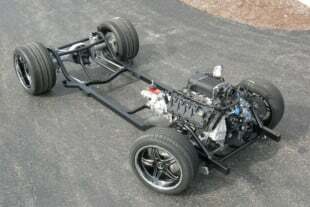 A Ford 9-inch rearend stuffed with 3.25 gears and a Truetrac splits the torque sent to the rear tires. Factory Five’s original kit includes and calls for a lot of aluminum panels, but Mike says that he did the majority of the car in steel. The hood was cut and then reinforced by Mike in order to allow the bird catcher to extend into the atmosphere. Just looking at the car you would naturally assume that the car is a show queen, but Mike says that he never takes it to event—other than SEMA obviously—and instead prefers to take the car for long leisurely cruises. Not only did Mike put the kit together with only the help of his two sons, he decided to make improvements to the car along the way—naturally, since Mike is a mechanical engineer by trade. Since its completion, Mike estimates that he has put around 1,000 miles on the car and has no intention of slowing down. He said that while it took him a couple of weeks worth of cleaning to get the car ready for SEMA he wouldn’t give up driving the car for the world. And that, right there, is true love.